designed to provide additional functionality by adding combined analogue signal acquisition and 24V DC power to drive up to 4 pressure transducers, and analogue control and 24V DC power to drive up to 4 analogue pressure controllers. 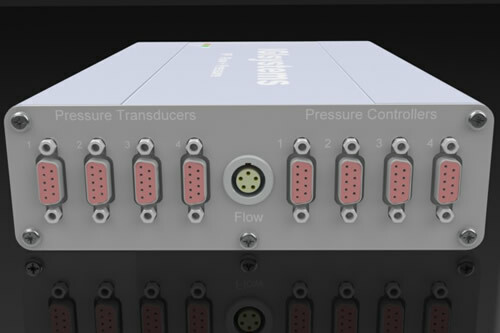 Power to and signal from 4 analogue pressure transducers is achieved via 4 D9 connectors. The 16 bit analogue to digital converter can be used for generic analogue signal acquisition from devices other than pressure transducers.